Shown on a Yamaha Vino 50 2001-2005 seat. 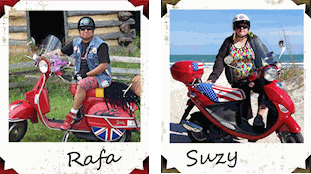 Use the dropdown menu to select your scooter model and cost. 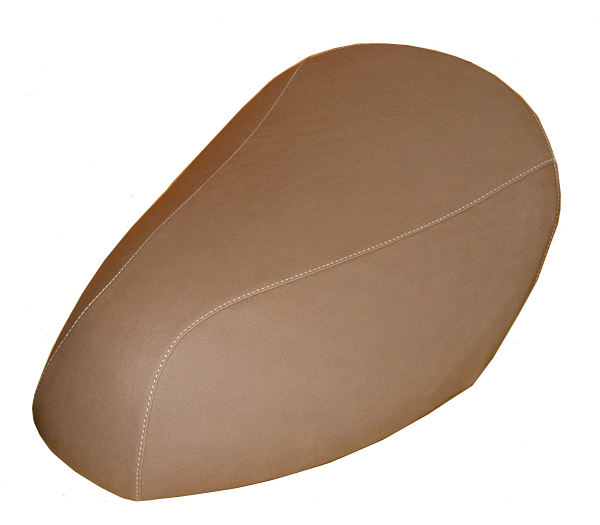 The Ultimate in practical luxury for a scooter seat cover is one of our rich faux leather covers. This material has a matte finish, and a soft hand like calves leather, but is synthetic, no harming of animals, and none of the upkeep and conditioning associated with real leather. We think you will love the understated elegance of this cover, with beige thread accents, this is one seat cover that will hold you firmly in place, the matte finish creates an incredibly anti-slip surface. Not only is it beautiful, but waterproof, UV treated, mildew and stain resistant, and super durable, extremely abrasion resistant. The price shown at the top of the page, is the least expensive version of this cover, generally on a smaller seat. The price of a cover for your scooter seat is next to your model in the drop down menu. That is the price you would pay, and the shipping.